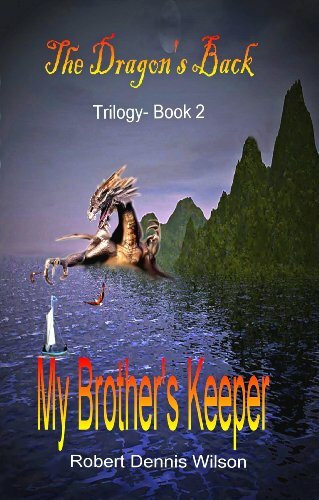 "MY BROTHER'S KEEPER: The Dragon's Back #2"
Continuation of the Epic Fantasy started in "THE POISON OF THORNS: The Dragon's Back #1" Which is also currently FREE! Here be Dragons, Bards, & mysterious Black-robed Villains lurking in the shadows. In a vengeance-ravaged land shaped just like a Dragon floating on a bottomless Sea, two orphaned brothers make choices that separate their destinies, placing them on opposite sides in the open conflict between Light & Darkness. "Well-written, this story uses tension with richly developed characters to exemplify a lesson on forgiveness, the Christian themes are undeniable. Thus this book is recommended for anyone who enjoys Christian Fantasy high adventure, they will not be disappointed." C.D. Sutherland, best-selling author of "The Chronicles of Susah" Trilogy.